These favors are bound to be conversation starters at your next event. Encapsulated into each glass votive is a three dimensional Eiffel tower created in meticulous detail. It stands on a bed of silver glitter pebbles with a stunning white rose and green leaf to complete the scene. Reminiscent of childhood snow globes, your guests will be enchanted with these favors. 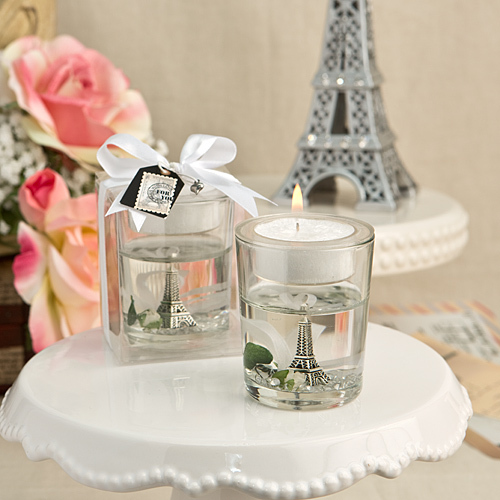 Each votive glass supports a tea light candle which floats above the Parisian scene. Adorn your tables with love and romance of Paris, and watch the little towers glitter as the gel reflects the candle light! A unique and wonderful favor to give at your next special occasion!